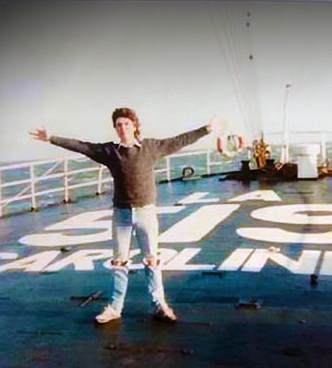 He later joined Radio Caroline in the mid-80's, where he was first heard from Caroline's new ship the Ross Revenge on the early morning of 28th November 1986. He had to stay on board much longer than originally planned, because his passport expired while he was at sea. This meant he could not go home by the normal route. His last show was on 19th January 1987. For a time he was a key member of Chis Cary's Radio Nova satellite team. A lot of people will remember him as the voice from Nova's Camberley studios during the short period that Radio Caroline loaned the Radio Nova transponder in 1991. Keith was later heard on Radio Nova International, QEFM, Buzz-FM, EKR, Merlin Network One. 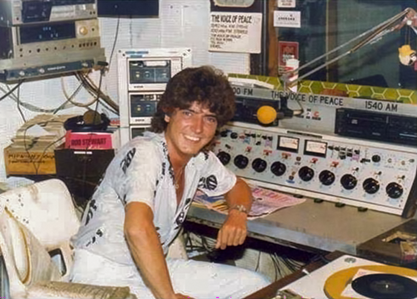 Keith about his time on the offshore radio ships: "I loved my time with the VOP best of all, playing what I loved and hoping the listeners loved it too and judging from my mail they did. Caroline was a somewhat different experience as during my time with Caroline 558 the station was heavily relying on playlists, as it was trying to replace Laser 558, which did not work very well for me. I ended up merely playing for the most part someone else's choice, not exactly Free Radio as I expected"
But now on Radio Mi Amigo International, once again I am free to pick the music that I'm sure our listeners will like, as real free Radio should be." From October 9th you can be a part of it every Sunday from 10.00 - 11:00 and 14:00 - 15:00 [CET].